The centerpiece of the sculpted cave-shrines at Longmen is the colossal Vairocana assembly sponsored by Emperor Gaozong and Empress Wu during the Tang dynasty (618-907). Fifty years after its completion, however, a consortium of court eunuchs added a display of forty-eight Buddha figures to its walls. This intrusive project allows us to explore questions about the spiritual and social purposes of Buddhist statuary and patronage in medieval China. Amy McNair is the author of Donors of Longmen: Faith, Politics, and Patronage in Medieval Chinese Buddhist Sculpture, published in 2007 by the University of Hawaii Press. She is Associate Professor of Chinese Art at the University of Kansas, where she teaches and researches early and medieval Chinese art. The Longmen Grottoes (lit., Dragon's Gate Grottoes) are located about 12 km south of the city of Luoyang in Henan Province. The grottoes, which depict Buddhist subjects, stretch about 1 km along the mountains Xiangshan (to the east) and Longmenshan (to the west). The Yi River flows northward between them. 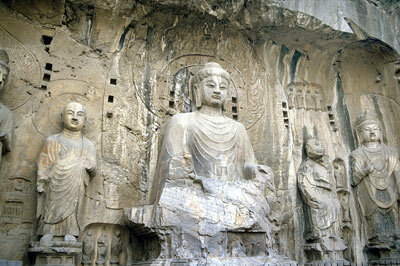 The Longmen Grottoes, along with Mogao and Yungang, constitute the most famous ancient sculptural sites in China. According to the UNESCO World Heritage Committee, "The grottoes and niches of Longmen contain the largest and most impressive collection of Chinese art of the late Northern Wei and Tang Dynasties (316-907). These works, entirely devoted to the Buddhist religion, represent the high point of Chinese stone carving." The Longmen Grottoes consist of more than two thousand caves and niches containing over 100,000 Buddhist images. In the year 2000, the Longmen Grottoes were inscribed on the UNESCO World Heritage List, which "includes 830 properties forming part of the cultural and natural heritage [of] outstanding universal value." The Sammy Yukuan Lee Lecture Series features a yearly lecture and seminar presented by leading scholars on Chinese art and archaeology.